We are Muffin and Houdini, goffins cockatoos that are 10 and 15 years of age. I, Muffin, was born in San Luis Obispo and I, Houdini, was born in Livermore. We both eat parrot mix, fruits, vegetables, rice and cornbread. Our favorite treat is peanuts. We are a bonded pair and have shared the same cage for ten years or so. We aren`t very socialized and have not been handled in quite some time. We do love each other very much though so must be adopted together. Neither of us talk but we do talk cockatoo talk to each other. 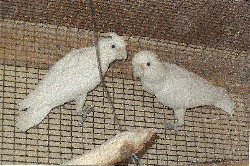 We are not big screamers but do vocalize in the early am and at dusk- just like cockatoos do in the wild. We are pretty easy to care for, and don`t ask for much except to be able to stay together. Perhaps you wouldn`t mind letting us live our lives out with you?